*The Traction Control System is not suitable for the rider's throttle control. It cannot prevent loss of traction due to excessive speed when the rider enters a turn and/or applies the brakes. Neither can it prevent the front wheel from losing grip. Suzuki’s Advanced Traction Control System* lets the rider control the throttle with more confidence in various riding conditions. As a result, the rider can enjoy sport riding with less anxiety. 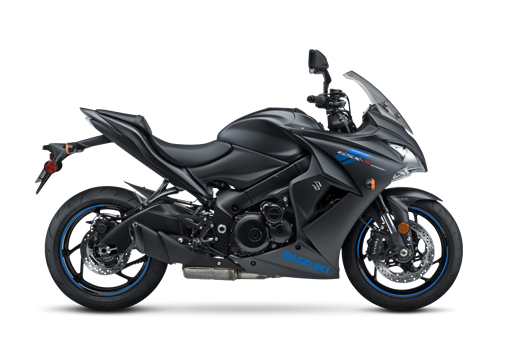 There are four traction control modes (1, 2, 3, and OFF) that the rider can easily adjust at rest or on the fly via a handlebar-mounted control. The difference between the modes is their sensitivity to road conditions. • Mode 1 is lowest sensitivity level; most suitable for skilled riders or in conditions that have good road surface grip (sport riding on good, smooth roads). • Mode 2 is a moderate sensitivity level; that is suitable for most riders or in conditions that have varied road surface grip (city riding, regular road conditions). • Mode 3 is highest sensitivity level; suitable for road conditions where the grip may be limited (wet or cold surfaces). • OFF disengages all traction control features.